New Delhi, 17 July 2017: A statement indicating the sanctioned, existing and vacant positions including backlog reserved vacancies of teaching and non-teaching staff (category-wise) in 40 Central Universities (CUs) under the purview of this Ministry are enclosed at Annexure-I & Annexure-II respectively. In order to address faculty shortages and to ensure that studies of students are not affected, the CUs are adopting different methods/processes of engaging ad-hoc faculty, Guest Faculty, Contract Faculty and Re-employed. As the ad-hoc teachers engaged by the CUs do not enjoy permanent status, there is no question of depriving the benefit to the reserved categories. As per the information of the University Grants Commission (UGC), there are 2758 ad-hoc/Guest/Contract/Reemployed faculties employed in various CUs as on 01.04.2017 and their University-wise details as on 1.4.2017 are annexed at Annexure-III. For non-teaching positions, data on employees on temporary basis is not centrally maintained by UGC. Vacancies in CUs at various levels are caused by dynamic process attributed, inter-alia, to retirements, resignations, deaths, deputations, expansion and opening of new institutions and filling up them is an ongoing and continuous process. Hence, no time limit can be indicated in this regard. It is pertinent to mention here that the onus of filling up of posts, lies in the CUs which are autonomous bodies created under the respective Acts of Parliament. 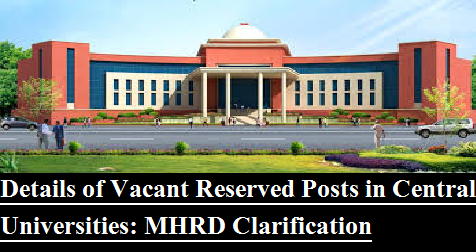 However, Ministry of Human Resource Development (MHRD) and UGC have issued repeated instructions to all the CUs to fill up the vacancies, including the reserved ones, on priority basis. This information was given by the Minister of State (HRD) Ministry of Human Resource Development (MHRD), Dr. Mahendra Nath Pandey today in a written reply to a Lok Sabha question.